We are all familiar with the beautiful illuminated manuscripts of the Splendor Solis, the best known of which is that in the British Library. The work proved so intriguing in the late 16th century that it was published in a number of printed versions. Some of these were hand coloured by the printer or by the owner of the book. There is a good example of this in the Young Collection in Glasgow, but I also found one in the sale catalogue for the books of the 20th Century writer Rene Alleau. This is the famous image of the man emerging transformed from the swamp and being greeted by an angel. 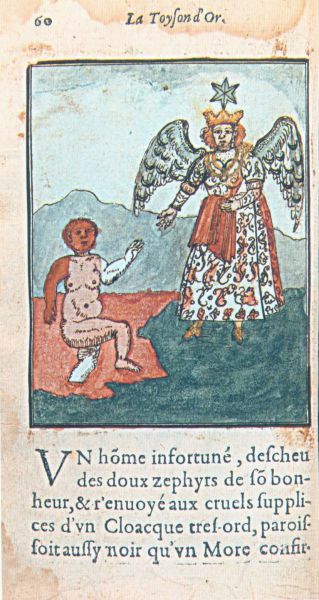 This is in Salomon Trismosin, La Toyson d'Or, printed at Paris in 1613 by Charles Sevestre. The person who coloured the image kept close to the original, painting one arm white and the other red, and colouring the spherical globe-like head red.